“ONO Organic Farms is a family-owned and operated, certified organic, hand-picked, tropical fruit and coffee farm located on the world-famous “Road to Hana” on the southeastern slopes of Haleakala volcano on the Hawaiian island of Maui. The climatic conditions of Kipahulu, Maui nourish a unique, isolated environment for delicious (“ono” in Hawaiian) exotic tropical fruit, coffee, and chocolate. ONO Organic Farms delivers fresh organic fruit and coffee to homes and businesses on Maui and ships a variety of ONO Organic products worldwide. Charles Boerner Consultants provides expert consulting services for family and commercial farms in Hawaii and around the world. Buy from ONO Organic Farms seven days a week from 10 a.m. to 6 p.m. at our roadside market in Hana (next to the gas station). Fresh organic produce and packaged products. 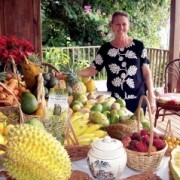 Enjoy our organic, tropical fruit tasting and farm tour.